My family has made the very serious and emotional decision to homeschool our 7-year-old epilepsy kid. This should be easy for me, a former certified teacher. I love the idea of school (and our local Catholic school is an amazing fit for my older kid). I support public schools (where both children will go in the fall because juggling two schools is just too much). But the private school could not handle the additional needs of an epilepsy kid who is likely going to get an autism diagnosis this week. To cover the time span between now and the end of the school year, without forcing my kid to transfer schools mid-year, I'm homeschooling. As a planner, I needed a plan. But what should the plan look like? It needed to be flexible (for seizure or melt-down days) but cover the actual material (to prepare for transfer back to public school in the fall). It had to give me enough organization to not feel lost, but not be too lengthy. I selected a two-page-per-day layout for my lesson plans in my planner because they offer a place to plan, to schedule, and to keep notes for my files. I am using different parts of the planner page for different purposes. The schedule is pictured above in the purple box. I am not scheduling my homeschool day. That would not allow the flexibility that my child needs. However, I do need to be able to glance at the outside of the home appointments and have a plan for those times. Mostly, if we are going out of the house, my kid will practice subtraction on his Kindle or free read. The lesson planning is pretty simple (pictured in blue square). Mostly, it consists of the page number in the textbook or the activity. For the most part, I plan too much for Mondays and plan less as I continue through the week. This allows me to adjust based on my child's needs. In the orange box, I list a few daily goals that I plan to have each day. I put a special page marker for homeschooling (red arrow), a code for each subject in the lesson plan (pink arrow), and a note page (green arrow) for things like spelling words in the spread. I am doing about a week of lessons in advance. After the initial planning, that means I only have to do one lesson plan per day. I am keeping about two weeks of these pages in my planner at a time. 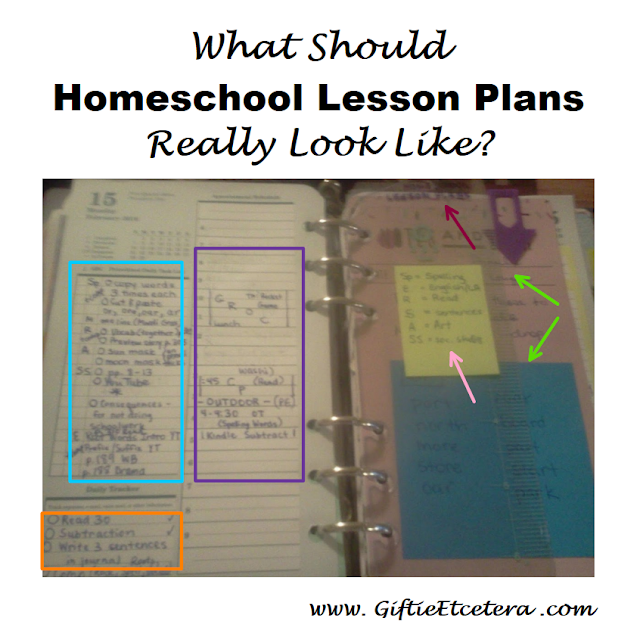 I have an old planner for filing away the pages and notes as a record of our homeschooling. In addition, I will take pictures of sample work and put them on a jump drive with the old planner. That should be sufficient record keeping and keeps paper filing to a minimum. But then there's this... really, you're so lucky to actually have the opportunity to do this for your child. Where we live it's prohibited (at a fine of 500 euro per day!) not to send your kid to school (unless it's impossible to find a school that fits your believes, but that's hardly possible in our multicultural society). So when school and my youngest didn't really work out (at all), we just had to sit it through for all those years. I hope this period will be good for both of you. For him to find peace (poor boy, it must be hard for him too) and for you to see your child getting back on his feet. Hi, homeschooling seems like a major challenge, but these tips will help those looking for ideas. I hope you will consider linking up with us at Literacy Musing Mondays. I know my readers will love planning ideas. Sending prayers your way for strength, patience, and success! What a good mom you are making the best choices for your child and your family as a whole. That you are able to do that both in mental capacity and to be able to work from home and care for your children is a blessing. I wish you the best and I know you can do it. I hope that keeping him near and helping him prepare for a school that is probably 1) closer to home and 2) better prepared to help him will bring you some peace. Thank you for sharing your blog with us. Your honesty is refreshing and your advice is very helpful. Good luck. Mary Hill - I will. Looks like a great link-up! First of all, welome to the homeschooling world :) I realize that temporarily homeschooling is going to look different than permanently homeschooling (namely in that we have more freedom when it comes to what we learn and when because my kids don't need to go into a prescribed curriculum again in a few months) but it is easier than it seems. If you spend the next months focusing on enjoying your boy's company and getting to know him on his level, you'll be able to watch him learn instead of fighting with him about filling in blanks on worksheets. As for homeschool planning, I have a project section in my planner with things I want to purchase (globe, games, instruments, etc), things I want to expose my kids to (art, music, places, architecture etc), household rhythm ideas, and a page per child with notes about theie personality, interests, and love language. Super informal but it has worked well for several years.